Now that spring has officially arrived, it's time to break out of that winter malaise and enjoy the season's fantastic warm weather and sunshine. As a dad, this is also the perfect opportunity to introduce your kids to your favorite outdoor recreation and leisure activities that your own father shared with you when you were young. So ditch those heavy winter jackets and grab your hiking boots – here are three great spring adventures to enjoy with your children. 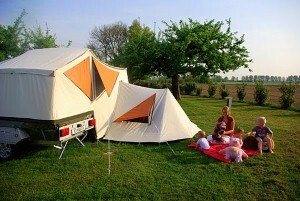 While it's still early in the season, you can begin planning for a mid-spring camping trip. Depending on your children's age, you may want to determine how intensive this expedition should be and tailor it to their maturity level. For younger kids, you might want to settle on visiting a relatively tame camping ground where you'll never be far from a hot meal or shower. If you're looking to rough it a little more, grab a tent and head out into the true wilderness. The days you spend cooking over an open fire, exploring local wildlife and gazing up at the stars from your sleeping bags are ones your children won't soon forget. If you're looking for some outdoor adventure without all the organization that camping requires, consider going on a hiking trip for the day. Investigate some of the local nature preserves, wilderness trails or state parks near your home. You can also make a day of hiking more engaging for your little ones by allowing them to read the map and giving them a list of birds, trees and animals to identify. Sometimes the best spring days are spent relaxing in a boat in pursuit of some fish. You can teach your children the finer points of angling while clocking some quality conversation time together. And at the end of the day, you'll have a delicious dinner to cook up.